Vitamin B12 drink - wolting-internationals Webseite! 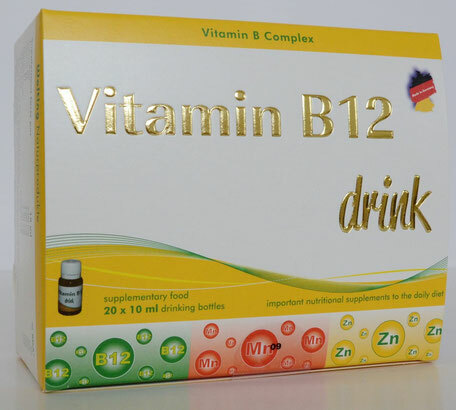 Vitamin B12 drink is a modern, liquid nutritional supplement and a positive addition to the daily diet. You feed the body with nutrients which are partially missing in the modern industrial manufactured food. Water soluble vitamin B12 takes part in some reactions as normal energy production, metabolism, growth and a healthy corporal development. They are essential for our organism. It is required for normal growth, cell reproduction and the formation of red blood cells. Stimulates appetite, promotes energy release, assists in preventing mental deterioration, helps with speeding up thought process, helps with clearing up infections, Provides protection against allergies and cancer. Used in the metabolism of fat, protein and carbohydrates. Protect against deficiency symptoms. Ingrediens: Zink sulfate, Vitamin B2: Riboflavin 5’-phosphat, Natrium, Vitamin B6: Pyridoxinhydrochlorid, Vitamin B1: Thiaminmononitrat, Manganese gluconate, Vitamin B12: Cyanocobalamin, Dextrose, Maltodextin, Inulin Oligofructose, Raspberry flavor, Citric acid, Silicon dioxide, Polysorbat 80, Sodium benzoate, Potassium benzoate, Sucralose, Water. Store below 25º C protected from bright sunlight. Store out of reach of small children. The stated recommended daily dose should not be exceeded. Shake well before consumption. Turbidity and bottom set are a sign of quality and have no influence on the quality of the product. Food supplements should not be used as a substitute for a varied and balanced diet and a healthy lifestyle. . Store below 25º C protected from bright sunlight. Store out of reach of small children.